If you consider yourself to be a car enthusiast, chances are you have worked tirelessly to customize every last detail of your car’s performance and appearance. Perhaps you have installed a custom exhaust, performed an ECM tune or even tossed on a set of custom wheels. Maybe you have installed some window tint to give your car a sleek look and protect your car’s interior all at the same time. But what good are all of those upgrades if no one notices? Sure, a custom exhaust can make your presence felt, but what about standing out from the crowd — literally? Maybe your car's original paint is wearing and you're tired of its current look. Perhaps you want more protection or you're just looking for a custom look. If you’re reading this, it means you’re considering the most dramatic visual improvement you could possibly make to your car: a custom car wrap. You might also be considering a new paint job. What factors should you consider when you are trying to decide which is the best choice for you? We’ll take a look at the advantages of wrapping your car and the advantages of repainting your car. But first, let’s explore some of the reasons you might want to consider a fresh new look for your car. Why Wrap or Repaint Your Car? So you’re tired of the long, slow walk out to your boring old car every day, but you don’t have the money to upgrade — not to mention the fact this one wouldn’t help you much in the way of trade in value anyway. For better or worse, you’re stuck with it for the foreseeable future. That doesn’t mean you have to endure the same old car every day. Spice things up with a new exterior color. A vinyl wrap or new coat of paint can make you feel like you’re driving a brand new car — or at the very least, a car that’s new to you. Few manufacturers offer anything in the way of customizable paint. Racing stripes are about fifty years past their prime, and even if you are the type of person who wants a giant Union Jack on your roof, that roof shouldn’t have to come attached to a $35,000 automobile. Applying your own vinyl wrap or custom paint design can open you up to a world of possibilities. Your options are limited only by your imagination and the skill of your designer and install technician. Perhaps you are still in love with your car, and that love is of the everlasting kind. You could afford a new car, but you don’t plan on getting rid of this one any time soon. While beauty is in the eye of the beholder, you agree with your friends who can only see a twenty-year-old car with a chipped, faded paint job. The motor and transmission are in good shape, so you plan on keeping it for another few years. Updating the look of your car with a fresh coat of paint or a vinyl car wrap can help you fall in love all over again. Here’s to the next ten years! The open road can be a harsh and unforgiving place. Congested roads can be even worse. In addition to the stones and debris that get kicked up by other vehicles, the sun puts a beating on your paint job. Factory coatings are rarely designed to provide adequate long-term protection from the hazards of the road. A vinyl car wrap or a more resilient paint job can provide extra protection against sun damage and road debris. Years down the line, your car will retain its value if it still looks as nice as the day it rolled out of the showroom. This will pay — literally — when the time comes to sell the vehicle. The primary factor in most people’s decision-making is the up-front cost. There’s no use discussing options that are beyond your budget. A quality paint job will cost thousands of dollars, but in the end, you certainly get what you pay for. The best paint jobs can make any car look even better than it looked on the new car lot. So what if you don’t have the funds for the top-of-the-line treatment? A vinyl car wrap can save you quite a bit of money, and still look good. Compared to the quality you would get from a cheaper, “budget” paint job, going with vinyl is a no brainer. Now, you can work your way into the stratosphere with the most complicated, laborious wrap jobs, in which case your out-the-door costs are going to rival quality paint jobs. But as a rule, a quality wrap job is going to be less expensive than a quality paint job. In terms of protection, vinyl offers a more resilient layer of physical protection compared to paint. Even a high-quality paint selection with a protective clear-coat won’t provide as much protection as having an entire other material protecting your car’s body panels and taking the brunt of the elements. If protection is high on your list of priorities, vinyl is the clear winner. Quality clear-coat paint can be expected to last a solid five to seven years if it is properly maintained. That means regular car washes and a few coats of wax a year. Failure to properly maintain your paint’s finish can expose the metal panels underneath to moisture and air, which is a recipe for rust. If you live in the Northern half of the United States, you should also take care in the wintertime to wash off the salt and other particulates used to treat snowy and icy roads. These substances can eat away at your car’s paint, as well as the undercarriage. With a vinyl car wrap, your only priority is keeping the surface clean. Regular car washes are advised, but even then, the dirt and debris won’t have a big effect of the vinyl surface itself. You won’t ever need to wax the surface of a vinyl wrap. Cleaning off the wintertime dirt is still important for keeping your undercarriage clean, but it won’t eat away at the vinyl the way it will a paint coating. Another big advantage of a vinyl car wrap is the ease of replacing or repairing a small portion of your car’s surface. If you incur enough damage to the vinyl surface to warrant a repair, you’re just looking at replacing one single panel. The cost in both time and money is minimal. If your paint job gets chipped or damaged in some way, the only way to fix it properly is to prep and redo the entire paint job. If your car has a vinyl wrap, the repair cost is easily justified. With a paint job, would you be more likely to just live with the damage, knowing the repair will be too costly? Creating a custom look creates a bit of a long-term quandary. When time comes to sell your vehicle, how easy will it be to find someone else who shares your love of aquamarine argyle patterns? If you chose to paint your custom design, your choices are shelling out to repaint it with a more neutral design or to take the value hit. Unique really only appeals to consumers who get to choose their own brand of unique. On the other hand, even the craziest vinyl design can be removed by the same technician who installed it. Quality vinyl wraps can be removed easily and don’t leave behind any discoloration or residue. Your resale value is retained, and since you have had a layer of vinyl protecting the original paint job for the last few years, it might even receive a little boost. When you are trying to decide whether to wrap your car or paint it, the impact on resale value should not be underestimated. A quality paint job doesn’t happen in an afternoon. For a skilled technician to do the job correctly, hours of prep time are required. Generally speaking, painting a car requires the following steps: Sanding the finish, removing the necessary panels, taping any trim and glass, and applying the coats of paint and primer, allowing adequate drying time, reassembling as necessary, removing the tape and checking the work. Can you afford to give your car away for a week or longer? And if you have your heart set on a high-quality paint job, can you really afford not to? A well-executed car wrap really can be done in a day, or at most, in a few days. All you need is a thorough cleaning of the car’s surfaces, a careful plan and some patience in applying the vinyl wrap. Once you’re done, there is no more waiting around for drying or reassembly. The week or more that it takes to pull off a high-quality paint job certainly is time well spent, but that amount of time isn’t a resource we can all afford. For most people, a job that competes in quality and takes a fraction of the time to deliver is the logical choice. Depending on the area you live in, it might be easier for you to find a qualified paint shop than it would be to find someone to do a quality wrap job. Because applying a vinyl wrap is a very difficult job, you want to find an experienced technician, not someone who “thinks they can handle it.” The job is way too costly to be someone’s guinea pig, and a bad wrap job will likely look worse than the original paint job you were trying to replace. 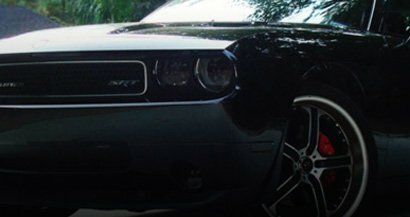 That said, we know the world of DIY car mods is proud and wide-ranging, so if you are determined to manage every detail of your car’s appearance or if you have some experience in the shop, we do have plenty of easy-to-follow instructional videos. A DIY paint job, on the other hand, is asking for trouble. If you already have the tools and expertise necessary to pull off a quality paint job, you aren’t even considering a vinyl wrap. Not every car is a candidate for a vinyl wrap. Though, in general, a vinyl wrap can be a great alternative to the traditional paint job, there are circumstances where, no matter the virtues of the wrap itself, it won’t provide the same result as a new paint job. For instance, if your car’s body panels have any physical imperfections on them, such as chips in the paint or snags in the clear-coat from rock damage, a vinyl wrap will do nothing to hide them or fill them in. Since applying a vinyl wrap is essentially just placing another layer over top of your car’s body panels, it will conform perfectly to every crease, divot and dent — for better or worse. The very same properties that give a vinyl car wrap its professional appearance also make it the less-desirable option for a less-than-perfect car. If your car is showing some road rash, the sanding and prep process for a new paint job will be the only way to address it. Likewise, the vinyl needs to have a good, healthy base layer to which it can adhere. If your car’s body panels have some rust spots, or if the paint is starting to chip, your install technician might have difficulties getting a clean adhesion. If your car’s current paint job is in a position where it really does need a repair, and not just a cosmetic fix, a traditional paint job is the way to go. Did your design look better on paper than it does on the car? It would be money down the drain, but it would be much easier to swallow a second wrap if you don’t like it. Could you afford a second paint job? If you have chosen to paint your car the first time, you are faced with the quandary, “Should I wrap or repaint my car?” That is a very expensive question to ask. If you are still asking yourself “Should I wrap or paint my car?”, take a look at our vinyl car wraps to get some visual examples of the possibilities vinyl car wraps can offer. Vinyl car wrap materials and manufacturing processes have improved to the point where quality can basically be written out of the equation. If you want a car wrap that compares in aesthetic quality to a traditional paint job, you can find a way to make it happen. In the past, vinyl wraps were cheaper because they were inferior. That is no longer the case. When trying to decide whether you should wrap your car or repaint it, you can turn your focus to other factors, such as time, cost and durability. You can combine these factors in a number of ways to produce a finished product that makes you happy and conforms to your budget.